Photographs of Mardi Gras Indians by Max Stern will be featured in a new exhibition at Adelson Galleries Boston with paintings by Robert Freeman based on the photos. The exhibition of new works celebrates a history of New Orleans parades coinciding with the city's 300th anniversary. 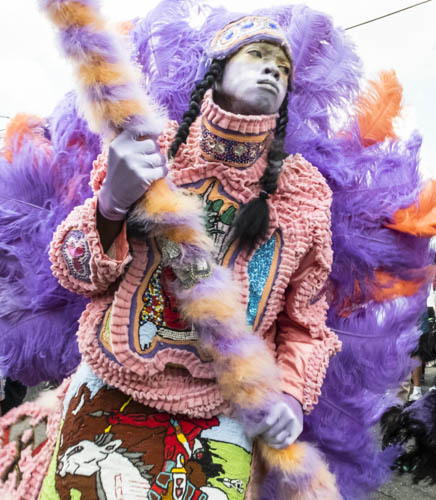 On the third Sunday in March each year, Mardi Gras Indians parade through the streets in New Orleans in what's known as Super Sunday, with tribal chiefs wearing elaborate, colorful suits with intricate hand sewn beadwork and headdresses. The paintings by Mr. Freeman and photos by Mr. Stern celebrate this historic New Orleans tradition. Mardi Gras Indians originated in the years following the Civil War, when African-American ex-slaves were taken in by indigenous Americans. The group blended African and Native American rituals in creating a community unique to New Orleans. "As a trial lawyer, I have always been interested in how one piece of evidence can suggest a whole narrative – a story to be inferred or hypothesized by the investigator," said Mr. Stern, an accomplished photographer. "When I first viewed the Indians on parade," he continued, "it was the intensity of the moment that kept me shooting the vibrancy of the masks, the power of the dancers' movements, the determination in their expressions. Behind the shot are the endless hours laboring over the 'suits,' selecting the beads, colors, feathers, threads; the profound pride in tradition; and the vivid contrast between the fantastical Super Sunday celebration and the daily routines of the performers and their followers." The Mardi Gras Indians exhibition opens March 2 and runs through April 19. 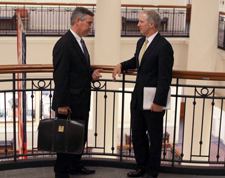 Mr. Stern is a partner at Todd & Weld LLP, concentrating his litigation practice on criminal defense and complex civil cases.